Tyler Gorman/Staff Photographer Redshirt junior outfielder Daniel Franchi extended his hit streak to eight games with a four-hit performance against Cornell. In the first of three meetings against upstate rival Cornell, the Binghamton baseball team took care of business. The Bearcats (13-12, 4-2 America East) rallied for 10 hits and seven runs in the first three innings alone to take down the Big Red, 8-4. BU had its bats going from the start, with redshirt junior outfielder Daniel Franchi and sophomore outfielder Shane Marshall logging opening singles. Redshirt junior infielder Alex Baratta was quick to drive them in off a double to make it three consecutive hits. Later in the first, senior outfielder Sean Trenholm capped off the three-run inning when he singled to center field to allow Baratta to score. Much like the high-firing offense featured in the first, the Bearcats continued to pour in runs at the top of the third inning. The Big Red (7-17, 2-8 Ivy League) surrendered another four runs on four more hits as the Bearcats improved the score to 7-2. Driving in the final run of the frame was Franchi, who singled to left center to plate junior infielder Justin Drpich. Franchi now has a hitting streak of eight consecutive matches, four of which were multi-hit games, as he improved his season batting average to .347 and his slugging percentage to .510. Binghamton and Cornell each scored one run apiece in the seventh inning to push the score to 8-4, where it was left untouched for the remainder of the game. Freshman pitcher Ryan Bryggman tossed three innings in relief and secured his first victory of the season, and his collegiate career, to bring BU above .500 for the first time this season. Having captured five out of its previous six games, the team will look to capitalize on its momentum when it hosts conference-leading Stony Brook this weekend. The Seawolves (18-10, 7-2 AE) have had nearly double the AE matchups as Binghamton thus far. SBU leads the AE in batting average, hits, RBIs, slugging percentage and runs. 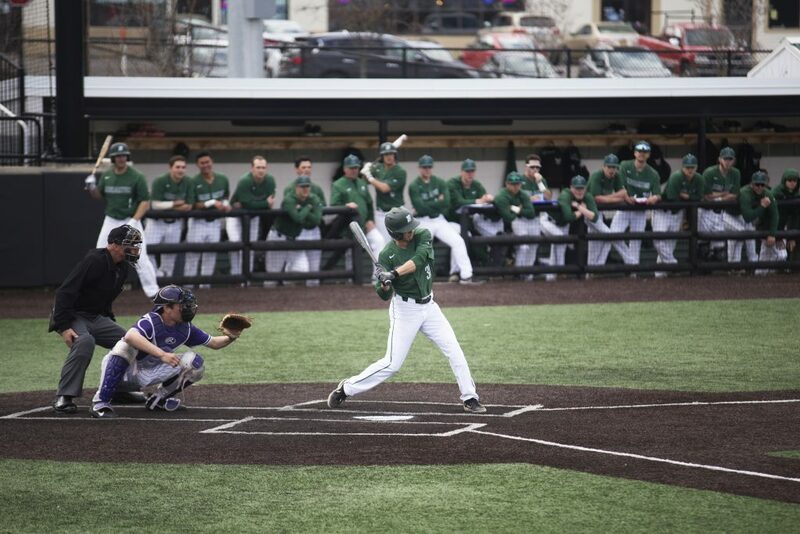 Despite the lack of many AE matchups, Sinicki still finds the nonconference meetings valuable as the team heads into its third AE series in 2019. Binghamton’s three-game showdown with Stony Brook kicks off at noon Saturday, April 13 from the Bearcats Sports Complex in Vestal, New York.